Rebecca and Courtney Marks, two sisters living with their single father, are unprepared for the twist in their life on one hot, August day. Of all the things that could transport them to an alternate universe, their mother's silver hand-mirror is the last thing they would have expected to land them in Viguanagura, a world that is still in the Medieval Ages. As the girls set out on their quest to find a mysterious man who can send them back home, they become involved in a revolution against the king and a dispute between the creatures called griffentaurs. Struggling to stay alive and stick together, Rebecca and Courtney become more involved in Viguanagura's fate and its mysterious age-old prophecy. Now, not only are they searching for a way home, but they are also on a path Destiny has set before them. Setting foot on Viguanagura's soil was only the first step in making the prophecy come true. Many more events will follow, and burning terrors is the least of their worries. Amanda and Sam are two high school teenagers living with their families in Bloomington, Indiana. 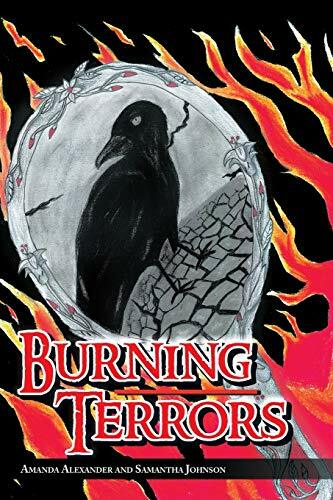 The idea for their debut novel Burning Terrors originally came from a dream Amanda had when they were both ten years old. At first they thought it would just be a childhood phase, but it lasted far longer than a couple of years, blossoming into a thrilling, adventurous trilogy. Their many accomplishments include balancing spoons on their noses, achieving complete mastery of telepathy, and reading almost every book in the fiction section of the library. In the future, Amanda and Sam plan on going to college to major in creative writing, traveling the world, and writing. This is their very first novel.